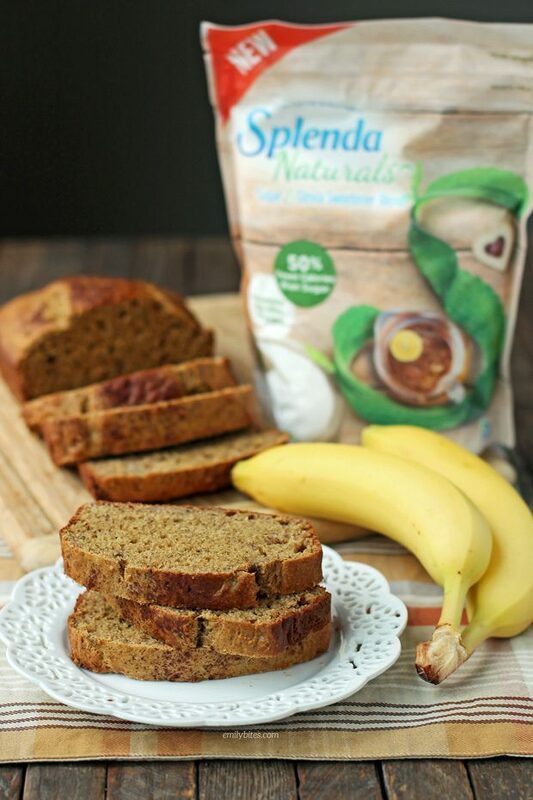 I have partnered with SPLENDA® to create this Banana Bread. I have been compensated for my time commitment to work with their product, however all opinions are entirely my own. Banana bread is one of my all-time favorite treats (and a great way to use over-ripe bananas), but it can often be a calorie-bomb, full of fat and sugar. I’m so excited to share this recipe for a lighter version because it truly tastes every bit as sweet, moist and swoon-worthy as the original, but it’s so much better for you! Perfect for a snack or as part of a healthy breakfast (just add eggs and fruit), a loaf of Banana Bread also makes a great hostess gift to bring to upcoming holiday gatherings. No one will ever guess a slice of this bread has only 152 calories! 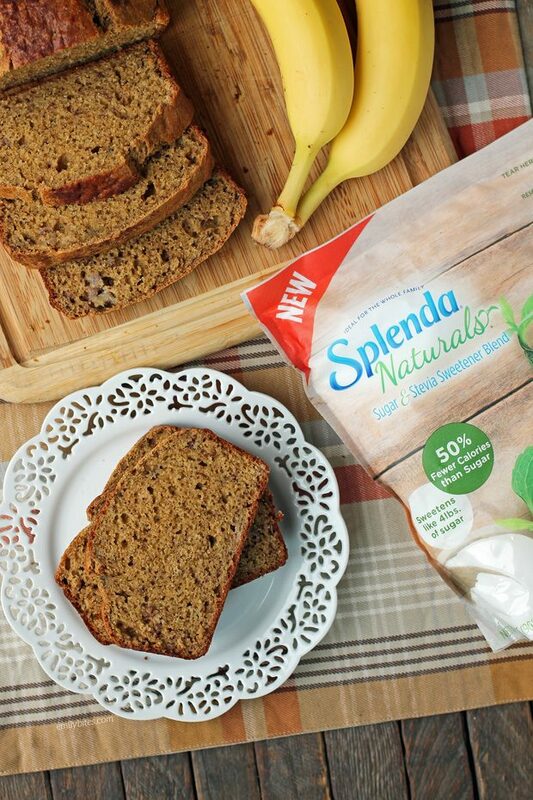 One of my secrets to lightening up this banana bread is SPLENDA® Naturals Sugar & Stevia Sweetener Blend, which (just as it sounds) is made only with cane sugar and stevia leaf extract. This new sweetener blend has half the calories and carbs per serving as traditional sugar with no bitter aftertaste! Plus, because the blend contains sugar it works great in baking, providing all the necessary functions (like rise, browning, texture and moistness). I also like that you only need to use half the amount of SPLENDA® Naturals Sugar & Stevia Sweetener Blend to get the same sweetness you’d achieve with traditional sugar. Tastes great, made with natural sweeteners, and helps cut calories and carbs? Sign me up! Visit Splenda.com/Naturals for more information on SPLENDA® Naturals Stevia Sweeteners, to locate a store that sells it near you, or to buy online. 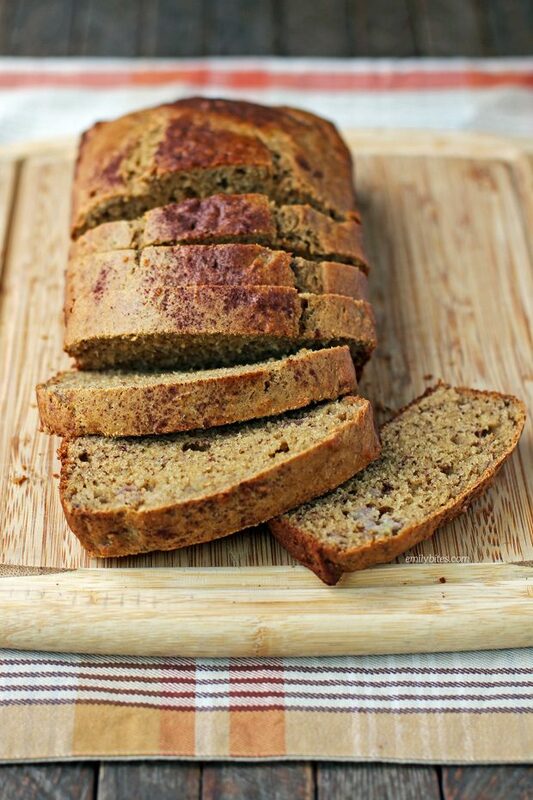 In addition to using a low calorie sweetener, I also replaced some of the oil in this banana bread with plain nonfat Greek yogurt, and used my favorite white whole wheat flour instead of traditional white. I’ve used this type of flour since I started blogging in 2010 and since I often get questions about it, it’s a whole wheat flour that’s made to look and taste a little more like white flour. Many different brands sell a version of this and it’s carried at all my local grocery stores, but if you have trouble finding it you can definitely substitute regular whole wheat or all-purpose white flour. Preheat the oven to 325 degrees. Lightly mist a 9×5 inch loaf pan with cooking spray and set aside. In a large mixing bowl, add the olive oil and SPLENDA® Naturals Sugar & Stevia Sweetener Blend and whisk together to combine. Add the eggs and continue to whisk until the eggs are beaten. Add the mashed banana, Greek yogurt, vanilla extract, baking soda, cinnamon and salt and continue to whisk until combined. Add the flour and stir in with a spoon until the ingredients are just combined. Transfer the batter into your prepared loaf pan and spread evenly. Bake in your preheated oven for 50-55 minutes until a toothpick inserted comes out clean. Allow the bread to cool for 10-15 minutes before slicing into 12 slices. Is this calculated using the flex ww program? Hi Mary, I’m assuming you are in the UK? From what I understand, what is called the new flex program in the UK is known as the new freestyle program in America, so I believe the freestyle smartpoints should align with your Flex points. Hope that helps! I have the regular Splenda. Would I use the same amount? Hi Jessie, I haven’t made this using regular Splenda before, but the Splenda Naturals blend I used only needs half the amount you’d use of regular sugar to get the same sweetness. From what I understand, regular Splenda measures cup for cup like sugar, so I would probably suggest using double the amount of Splenda as is listed. I hope it turns out delicious! Great question! It is a half replacement for the regular SPLENDA® when you use SPLENDA® Naturals Sugar & Stevia Sweetener Blend. For example, if a recipe calls for 1 cup of regular SPLENDA®, you’d use 1/2 cup of the SPLENDA® Naturals Sugar & Stevia Sweetener Blend. Hope this helps! Love you site. I am a Lifer. I’m told that recipes that you enter into you “recipes” will automatically convert to the new system. Great recipe! I used 1/4 cup Splenda brown sugar blend. Plenty sweet enough for me. Hi do you know how to make gluten free? Thx! I’m sorry, I don’t have any experience with gluten free baking! Please advise how much shredded zucchini to use if I would like to substitute it for bananas. I never received the first request! I have never made this as zucchini bread so I really can’t accurately advise from experience. Feel free to play aroumd with it! Please advise amount of shredded zucchini needed to substitute for bananas. Your recipes are delicious and easy to prepare. Us Weight Watchers are HAPPY‼️ Thanks. Hi jus joined ww here in uk and would love more help advise on no recipes please. I’m a recipe blogger, so I’m a little confused and not sure what you are looking for from me if it’s not recipes! If you joined Weight Watchers and would like more information then I would suggest talking to your Weight Watchers leader or using the Weight Watchers website. Good luck with your weight loss journey! I made banana bread and it was great! I used the white wheat flour and was really pleased. I did used 1/4 cup of light butter (4 tablespoons) instead of the olive oil. Loved the Splenda Naturals. No aftertaste!! Will consider using in other recipes! A lot of times I substitute unsweetened applesauce for oil when baking. Do you think that would work in this recipe to lower the points? Can anyone give me details on the Land O Lakes Light Butter? I found something in a tub, but nothing in stick form. What am I looking for? I want to make sure to get the correct item. There are sooo many options. but taste is important, and I do like my butter, 🙂 What are the points per tablespoon? Thanks!!! The site has the nutrition etc.